In the cute village of Garland, right on the main Ave, there is a tiny space that brings music to your ears! Especially if that music has a bent toward bluegrass or jazz. Cole Music Company has a name that is bigger than its little space but than many great things are found in little spaces! 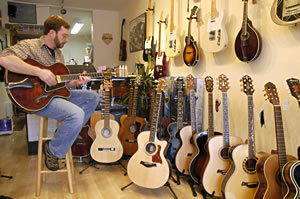 The shop focuses on instruments for jazz and bluegrass players and creators. The walls are lined with a nice selection of vintage instruments and Coles also sells new and used guitars and amplifiers. Coming from a musical family the owner is a second generation musician and instrument repair specialist. 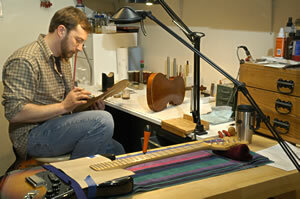 Many types of instruments come in to be repaired and go back out fixed, in tune and ready to play a new song. of stringed and woodwind instruments.